By far Amanda Block’s best-known and most popular work, Expanding Red was one of a series of water colors using a unique process allowing the creation of very vibrant abstract images. These were accomplished by using special inks on a paper of unusual properties. Amanda did these works near the end of her working career in the early 1980’s. They were some of her last efforts. Soon after, when she no longer felt she had the capacity to “control the line” as she said, she retired. Expanding Red and at least one other, but perhaps two other, works were purchased by the gallery Editions Limited and reproduced. It is unknown how many reproductions of Expanding Red were created, whether one edition or two, but the number may have been in the low thousands. Editions Limited Gallery seems unable, or unwilling, to research the question. Amanda signed a very large number of these works, and they sold exceedingly well. Queries to this website about Amanda and her work very often concern Expanding Red. It seems to have been very widely distributed. 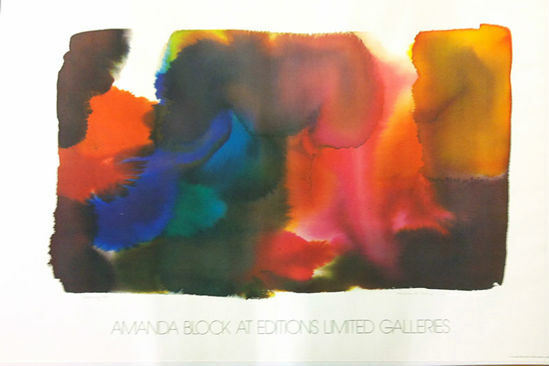 AmandaRBlock.com has several copies of this reproduction in varying conditions, but the original which became the property of Editions Limited seems to have vanished. Several original water colors using the same technique are available here in the Water Colors portfolio. Pricing available on request.